TechLabs kids are the next generation of creators, designers, engineers, and developers. Check out some of the awesome things kids have made below. 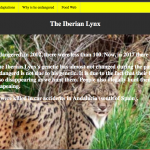 Jaime made this web page with all kinds of information about the Iberian Lynx from scratch. He even turned it in as a school report. Max built this website using years of HTML skills honed at places like TechLabs, and incorporates many features that give it a finished and optimized look. The data was collected from over three months of intensive research, back-checking of facts, and data collection. 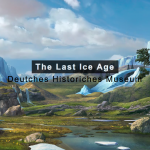 The website was optimized for easy understanding, interactivity and a collection of all the data you need to know about the last ice age. Kids had loads of fun using a Raspberry Pi motion detector and camera to create a stop motion .GIF. Our Robotics program is a huge success. The kids build, program, customize (using 3D Design/Printing, and lots of „old-school“ electrical tape) and battled their robots in the Sumo ring. We even teach them the basics of applied Artificial Intelligence. The kids‘ champions test their mettle against the instructors‘ robot: The Kraken – renowned far and wide for its fearsome battle skills. Check out this video from the Winter 2017/18 Robot Tournament in Basel.